Enhance the beauties of your place, how? 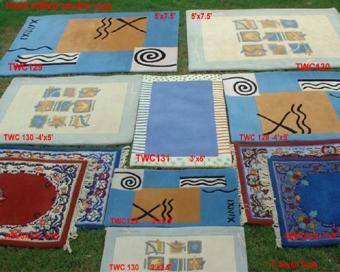 Buy an expressive range of hand tufted Carpet from one and only truthful name that is Seven Seas Exporters. Moreover we can manufacture the rarest range of carpets that is woolen carpet which you cam not find easily in the market place. Easy to use and washable at home, these hand tufted carpet donâ��t require a special care. Best of all, these are available in vigorous designs and eye catchy colors. We are the bona fide manufacturer and exporters from India and the only approachable name for the deal of wholesale carpets.